If you’re not a marketer, then you might be super confused about how to actually grow your traffic and your revenue through that increased traffic. While the reality is that business is hard and you must constantly be adapting to how the market changes, business and growth can feel downright impossible if you have no idea what you can do to correct your course and improve your fortunes. If you’re an executive, maybe a developer founder, then you need to rely on outside help (or hire it inhouse) to grow your business. You can get started on your own and learn a lot from very smart entrepreneurs who have come before you and learned how to market their business and themselves, but at some point (and likely quickly) you will realize that you are not the right person to be doing the marketing yourself. Your business simply gets too big and you need help, but you don’t know how to figure out if the person or entity you hire is being effective. I’ve spoken to and worked with hundreds of business owners by now, and when a SaaS founder or head of marketing comes to us looking for help, these are the metrics I find myself time and time again asking them about. All too often the numbers are unknown, which simply means there is more work for the marketer or current business to do in order to understand how to move the numbers in the right direction. Many of these I’ve come across on my own from all the conversations I’ve had, but I’ve also taken the time to understand the advice given by seasoned SaaS founders and investors around the numbers they watch in their own companies or investments. If you’re a SaaS founder/marketer and looking to scale up your team while measuring their effectiveness, these are the metrics we recommend that you know and watch. At my old agency we talked about this as becoming “more famous”. The idea behind that is that the best way to grow your customer base is to get more potential customers coming to your site however you can. While a lot of marketers (I’m guilty of this as well) will talk about how you need to get more of the right customers to your site, not just more traffic, the reality is that most businesses just need more traffic so that you can confidently find the right channels to then invest in more and those that are not showing positive movement yet. While this can give you a good quick-look overview of how you are doing, it’s also not deep enough to be really actionable. Hopefully your company is at the point where traffic won’t be going up by 1,000 percent from 10 to 1000 visitors a month, but rather going up 30%-50% year on year from tens of thousands to more tens of thousands. tie them back to revenue. So traffic is a directional metric, but one that I believe more SaaS companies should focus hard on making go up and to the right faster. As a software company where your customers pay you money each month for access to the product that you offer, you need to not only get more traffic (see above) but also know how well those visitors are converting into customers. Every SaaS company is different, but you likely offer a freemium version or not, a free trial or not, require a credit card or not, or have a sales cycle that is necessary because your offering is higher priced than someone will simply buy with a credit card online. When we talk about leads we have to be specific about which type we are talking about. When you see a company selling you “leads”, they’re probably of the first type and you’ll need processes for the marketing team to qualify them before passing them along to the sales team to qualify. We generated 1,500 top of funnel leads this month, which turned into 750 marketing qualified leads and 300 sales qualified leads. This means a 50% conversion rate from leads to MQLs, and a 40% conversion rate from MQLs to SQLs. 20% of leads generated overall become SQLs. See how actionable that is? That’s what moves the business forward and you can optimize as you open up the top of your funnel. But you cannot work towards better conversions to paying customers if you are just reporting on “leads”. The next metric you need to know is your customer’s lifetime value, both in aggregate as well as by plan if you offer multiple levels of payment. One customer on your entry level plan might be work $300 a year while an enterprise customer might be worth $10,000 per year. As you probably realize, you can pay a lot more to acquire an enterprise customer (though your lead -> MQL -> SQL conversion rates will be lower) than to acquire an entry-level customer. Not only that, but your marketing strategies will necessarily be different (and likely much more automated) for the entry level customer than for the enterprise customer. If you know your customer lifetime value and time to profitability (see the next metric), then you know how much you can pay to acquire a customer. If you don’t know their LTV and TTP, then you have no idea if your customers are profitable. If you’re not heavily venture backed (or honestly even if you are) but are instead bootstrapped or only took a light funding round to get you started, you need to be concerned with profitability or at least break-even financials. In the bootstrapped world, profitability is your funding and what allows you to reinvest into growth to keep growing faster. As such, you need to know how long it takes for a new customer to become profitable. If a customer’s lifetime value (LTV) is $300 because they pay $30/mo for 10 months on average and you paid $100 to acquire them, then you know that to simply recoup that spend (outside of salary and other business expenses) it will take you 3.5 months for that customer to become “profitable”. If they churn quicker then they are unprofitable, and if they stick around longer then they are wildly more profitable. In the above example, three and a half months to customer profitability is actually pretty good. There are many companies who do not understand their LTV or cost of acquisition and thus have many customers who will quite simply never be profitable because they have additional expenses (support etc) on top of the high acquisition cost. If you’re investing to get customers, lowering your customer’s time to profitability helps your business. You can either lower acquisition costs or raising prices to make them profitable quicker, which allows you to reinvest your excess cash faster to grow even more. Growth is good, and should be a mathematical formula! We’ve talked around this a few times now, so let’s talk about your custom acquisition cost (CAC). The simplest way to calculate your CAC is to take your overall marketing spend (let’s say $1000) and divide it by the number of new customers (let’s say 20) which leads you to an average CAC of $50. So what? That looks good on an investor deck when you’re seeking funding and maybe it’s a good initial place to understand overall if your marketing spend is even close to profitable or efficient, but it does not provide any real insight to you. To get that insight, you have to look at cost of acquisition by channel and type of customer. Part of the reason marketing is so hard is because the paths to conversion are murky at best and opaque at worst. As marketers, much of our work is trying to get clarity into how customers are finding us and moving down the funnel to a final conversion. Because of this, some of your channels are going to be relatively easy to define CAC based on last-touch attribution models whereas others like SEO are going to be much more difficult because the investment is broad and diverse and happens over time. When we get into multiple subscription levels for your business, then it becomes even harder. At minimum, you need to break down acquisition costs across channel by subscription level. If you’ve followed Dan Martell’s advice of “one offering, one price” which lets you grow faster, then your work will be much simpler. If you’re trying to offer different levels or work into larger LTV customers, then you’re going to have more digging to do. My final advice here is going to be that you shouldn’t expect this to be a 100% exact science. You can’t say down to the cent what each channel is driving (though you should be able to say that for what you are spending on the channel), but you can have a good ballpark of if the channel is converting or not and what those “leads” are turning into for your business. So to wrap up, you need to work towards understanding the cost to acquire a customer and then clarify that number according to your different subscription levels and lifetime values. Ah churn. You’ve heard about churn and are probably struggling with it. I know I’ve struggled with it with services-based businesses before, and the SaaS companies who struggle with it are most as risk of going out of business. Churn is the silent killer of SaaS businesses. Churn is not hard to calculate, but it is hard to fix. And you need to understand both. User churn is the percentage of your customers who cancel every month. Usually an acceptable number for software businesses is under 5% churn each month, and SaaS businesses that are doing really well often have a churn percentage under 3%. If you’re adding 10% new customers every month and only 3% are churning, then you’re net adding more customers each month and do not have to add very many in order to keep your MRR/ARR steady to growing. Revenue churn is the percentage of revenue that the churned customers comprise. You might have 3% net user churn, but if those users are large customers who are paying you a lot money each month then you’re going to have a bad time. The number you should really watch is revenue churn. Replacing a $1,000/mo customer is much harder (and more expensive) than replacing a $29/mo customer. You’ll need 35 new $29 customers to replace just one $1,000/mo customer! My final tip here is to record churn every month as far back as you can and going forward so that you can see how churn rates are changing over time. 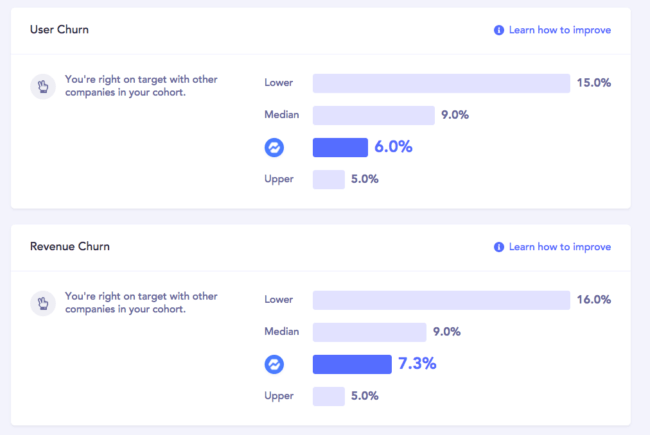 If churn stats to get out of hand (probably on a specific subscription level) then you can make decisions about how to optimize your product or revenue streams to keep your business heading in the right direction. This metric will likely be a source of contention but I think it is worth mentioning and tracking. I should also say that this is not a metric that is owned by the marketing team, but it is very much one that marketers should keep an eye on and know. Why? Because revenue is what drives businesses and businesses don’t stay alive if they cannot turn a profit. Marketers need an understanding of how their efforts and marketing spend are contributing towards the bottom line and what they can do to help the business achieve its goals. One thing to keep in mind here is that short term profitability is not necessarily the right thing to optimize for. If you’re bootstrapped and at the beginning of your journey, then you need to focus on a) audience generation and b) revenue generation, not profitability. You need to stay alive as a company (and as a founder! ), but profitability is not what you optimize towards. In other cases, if you have a war chest of cash and are ready to hit the burners on growth, you can afford to operate at breakeven or even a bit in the red for an amount of time (that time differs depending on how big your war chest is!) in order to grow faster and then get back to profitability. This applies to both SaaS startups doing low seven figures a year in revenue all the way up to companies the size of Amazon. So marketers/founders, understand that profitability/margin of revenue to expenses is not a marketing metric but it is a metric that marketers need to know. I mentioned this above, but it is such a vital metric that I think it needs to stand on its own. This metric majorly applies to B2B companies which have a sales team that is responsible for closing high value deals, but can also apply to more consumer focused software companies who are trying to convert visitors from an anonymous visitor to an email subscriber to a free trial and finally to a paying customer. This metric is important in both cases because it allows you to know how many new visitors/emails/free trials you need to generate in order to make more revenue. Without this understanding you’re flying blind and increasing numbers for the sake of increasing numbers. To hit your goals, you need to know what is possible and what is big and audacious as a goal (BHAG) and then build your strategy to hit those numbers. I love this metric because it gives you very specific direction on how to improve your revenue if that is something that you are focusing on doing. You will have to run tests and change processes to move this conversion number (and at some point your focus is better spent on generating a larger audience), but by moving it you can directly make more revenue for the company. These are the metrics I have watched for SaaS consulting clients of mine, and that SaaS founders and other marketers have told me that they value. 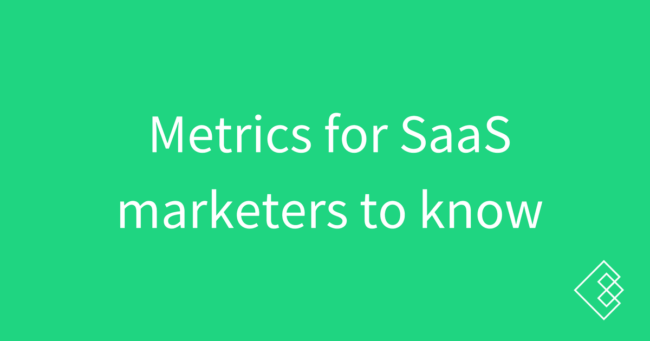 If you’re a SaaS marketer/founder, what other metrics should be included?